While surfing the intertubes the other day for more Chanukah ideas, I found this great recipe at More Quiche Please. 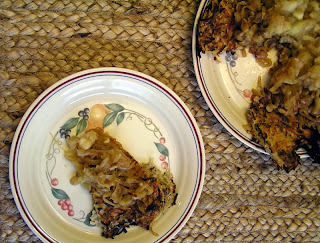 Tali takes a gigantic latke bakes instead of fries it, then tops it with layers of traditional fixings. The Chanukah version of a pizza! Of course, you can scale it back down to ordinary, appy-sized minis to serve before chowing down on turkey. Or serve as a Thanksgivukkah side in place of mashed taters. I made this recipe with a butter-olive oil combination since I planned to have it as part of a dairy breakfast. For a parve version, use all olive oil. Being that it's almost Chanukah, using oil is more authentic anyways. I liked this version so much that I also served it as lunch, alongside mixed greens. Be aware that it a a topped latke doesn't reheat very well, since those layers of onion and applesauce prevent it from recrisping properly. But I didn't mind a bit, scarfing it up ever so elegantly with a knife and fork.